Batman and Robin. Warner Brothers 1997. Once again, here’s a film that lives in infamy, a fate that befalls far too many superhero movies. 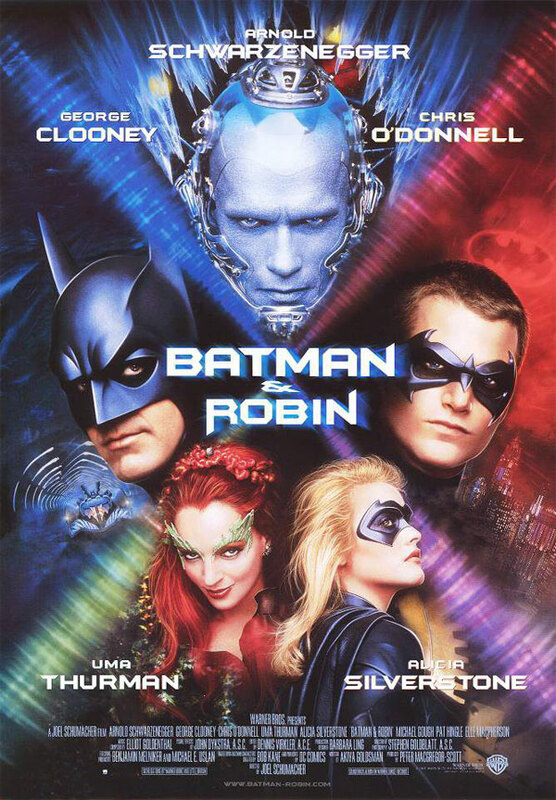 Often derided for being the campiest movie of the Batman series, it’s… well, it broke the franchise. Look at it this way, though: between it and Catwoman, it made Batman Begins possible. I’m hoping to find more reason to appreciate it than that, but if George Clooney is allegedly giving refunds on people’s tickets, how great can it be? While Robin chafes under Batman’s lack of trust in him, an insane scientist in South America creates the super-soldier Bane and then tries to kill plant apologist Pamela Isley, who is instead turned into plant themed supervillainess Poison Ivy. Also refrigerated supervillain Mister Freeze steals diamonds to power his suit as he tries to build a super-sized cold beam and cure his cryogenically frozen wife. Also Batman’s butler Alfred’s niece Barbara shows up at Wayne Manor and reveals that Alfred is dying. Also… no wait, that’s everything. As much as I wanted to see how George Clooney handled the role of Batman, I’m extremely disappointed, and I have only myself to blame. Clooney isn’t tough enough to be Batman, and he’s not upper-crust enough to be Bruce Wayne. He’s just every other George Clooney role, awkwardly forced into being a superhero. As much as I criticize the complex plot which shatters the two-villain limit that’s become apparent as an indicator of good comic book movies and bad ones, and as much as I wince at the campy lines, what gets me is how over-designed the film is. The batsuit has more detailed muscles than any human being ever had. The batmobile looks like it would shatter at the slightest touch, and there is an observatory held 1000 feet in the air by a colossal statue. Another statue holds up a highway overpass. Gotham is covered in creepy giants. Burton’s Gotham was a cramped place, Schumacher’s Gotham is half the size of Delaware. This movie has a sense of fun, but it also has an enormous well of embarrassment that doesn’t run dry. I laughed at the movie’s jokes almost as much as I laughed at the movie’s attempts to be serious. Watch this movie: with a RiffTrax commentary or similar. Or friends that make their own. Don’t watch this movie: waiting for Heath Ledger to show up.